At Oral-B we care for your oral health by developing innovative products that are trusted by dental professionals worldwide. Ergonomically designed handle for comfort and control. Blue Indicator® bristles fade halfway so you know when to replace your brush. 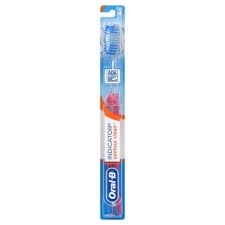 End-Rounded Bristles - Carefully polished end-rounded bristles are gentle on your teeth and gums.